Congress President Rahul Gandhi and United Progressive Alliance Chairperson Sonia Gandhi Sunday visited a beach restaurant in Goa. The two leaders are in the coastal state since Saturday on what Congress leaders said was a "private visit" and did not include meeting party functionaries. Writing about their visit to a beach shack restaurant, Rachna Fernandes, a local resident, said on a social media platform, "awed by his charm and modesty". 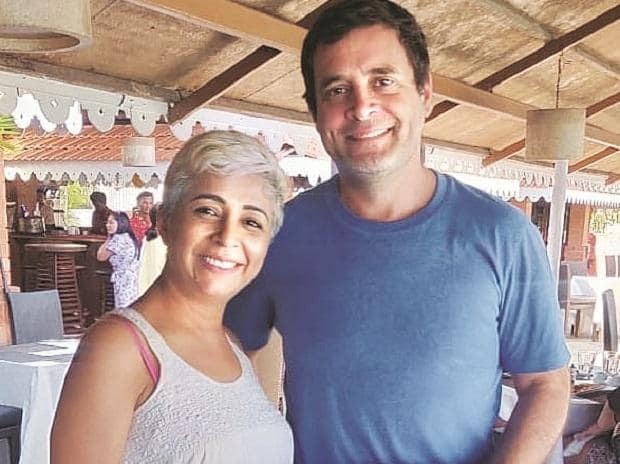 Fernandes, a dentist, said in her Facebook post she was at a seafood restaurant in Betul in south Goa where she bumped into the two leaders. She also posted a picture of the Congress president in a blue T-shirt on her Facebook page (pictured). For the Congress, OROP means "only Rahul, only Priyanka", said Bharatiya Janata Party (BJP) President Amit Shah on Monday, giving a new expansion to the initialisation for "the one rank, one pension" scheme. Addressing a BJP Panna Pramukh Sammelan at Hamirpur in Himachal Pradesh, Shah said the Narendra Modi government implemented OROP for ex-servicemen in the true sense, while for the Congress it meant something entirely different. National Conference leader Omar Abdullah (pictured) took to Twitter to respond to Shah’s jibe. Abdullah said the country was suffering from too much “ODOMOS”. "...The rest of the country suffers from too much ODOMOS — overdose (of) only Modi only Shah." At a recent event in IIT-Bombay, retired Supreme Court judge J Chelameswar began his speech by pointing out that he was finding it difficult in hearing what was being said by the organisers over the microphone. "It could be due to the acoustics of this hall, but I would think at IIT, someone would be able to fix that problem," he said, doffing his hat at the potential of the students gathered.